SAN ANGELO, TX — San Angelo’s famed tattoo artists, the Trufant Brothers, are celebrating 13 years in business Wednesday and the most renown tattoo artist in the country is coming to celebrate the anniversary with them, and you. He’s arriving on a Harley with his best friend, the lead singer of an infamous alt-rock band, also on a Harley. Oliver Peck, founder of the Elm Street Tattoo in Deep Ellum in Dallas, is also a star of the Spike TV show called Ink Master. He’s riding on what the duo calls the Western Bike Tour 2018 with his friend Ben Nichols, front man of the band, Lucero. Both are stopping through downtown San Angelo. During the day, Peck will be tattooing at Trufant Brothers, 227 S. Chadbourne St. At 9 p.m., Lucero’s Ben Nichols is performing a special acoustic show at Blaine’s Pub, 10 W. Harris Ave. The two venues are about three blocks apart. WATCH: Lucero "My Dearest Wife"
The Trufant Brothers opened their doors on August 15, 2005 on Caddo St. where the two began their journey of becoming San Angelo’s most sought after tattoo shops. This year, the Brothers upgraded and relocated the store, joining the thriving downtown community at the intersection of S. Chadbourne and Concho Ave. Throughout their successful run in business in San Angelo, you may have heard of the brothers. In 2010, it was the Trufant Brothers who founded the annual West Texas Tattoo Convention. This year marks the 9th anniversary of the event. Joining Peck Wednesday at the Trufant Brothers shop are Josh Williams, also an artist at Elm Street Tattoo, as well as Greg Christian from Tattoo Faction in Cleveland, Ohio. If you’re into ink, Wednesday is a great opportunity to hire a nationally acclaimed tattoo artist. A few months back, Peck’s team reached out to the Trufants, asking them if they’d be interested in hosting them on one stop of their Western Bike Tour. The duo Peck and Nichols have been going on these tours, which have proved popular, for about half a decade. The idea of the Tour happened with Peck learned of Nichols loading just his acoustic guitar on a motorcycle and touring bars across the country singing. Peck liked the idea so much that he joined his friend. 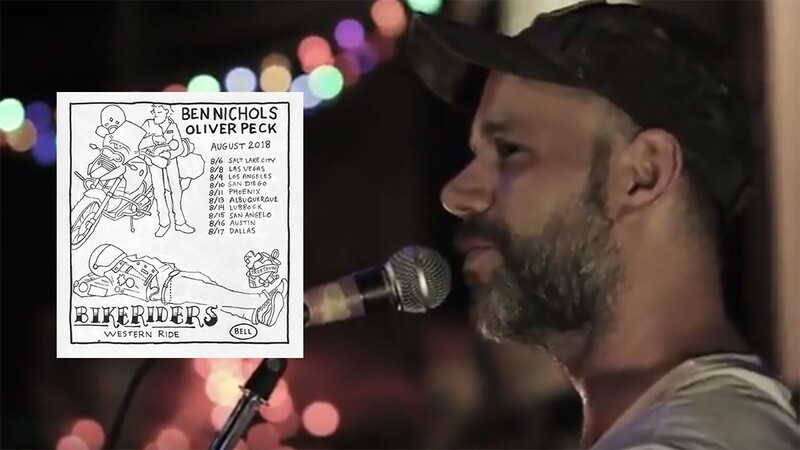 So, the duo combines Peck’s artistic tattoo art with Nichols music, turning the day into an ink-slinging, Ben Nichols-singing event at each stop. The Trufant Brothers anniversary party will be held at their brand new downtown location on 227 S. Chadbourne St. where they will be barbecuing and tattooing all day. The shop opens at 1 p.m. and closes at 9 p.m.
After all of their hard work and the buzzing of the tattooing guns have ceased for the night, the Brothers, along with Oliver Peck, Josh Williams and Greg Christian will head over to Blaine’s Pub to join Ben Nichols, as he brings his musical talents to the Blaine’s stage at 9 p.m.
Tickets to the show on August 15, 2018 at Blaine’s are $15 and are available in advance on Stubwire here. I have some professional musicians in my family. One of them plays hard rock. but me , i am into snow fluffly songs. i actually did meet Anne Murray ya know, one of many. not a real musician right, not literally but they were cranking this one out from live on top of the Cactus Hotel. I used to listen to those songs traveling out across the country's highways.